Steve Churm, Publisher of OC Metro is “Kruisin for Komen” this month to celebrate breast cancer awareness. He has teamed up with Spa Gregories for a promotion benefiting Susan G. Komen for the Cure. 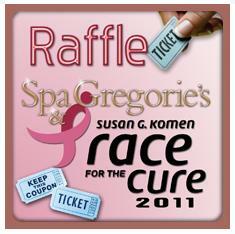 Spa Gregories will be selling raffle tickets through Nov. 7, with all proceeds going donated to Komen OC. If Spa Gregories reaches its goal of $15,000 in ticket sales, Steve has promised to go pink from head to toe when he broadcasts the OC Metro Minute on Nov. 8. So please tell everyone know to buy a ticket! Raffle tickets are one for $20, two for $30 and seven for $100 and can be purchased at any Spa Gregories location or online at SpaGregories.com. Komen OC in the News This Week! We have been so excited to appear in some Orange County news articles this week announcing the topics of our new Board of Directors and the donation we received from Conquest Racing. You can see one of these articles, in the OC Metro, by clicking HERE. A piece on our new President of the Board ran in the Orange County Register’s Fountain Valley View below, as well as HERE online.